Vidya Balan, Neha Dhupia, Manav Kaul et al. "Tumhari Sulu" is a comical slice-of-life film for the youth and families. Vidya Balan (Sulochana a.k.a. 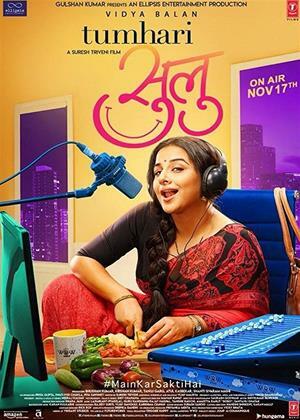 Sulu) essays the role of an beautiful, enthusiastic and happy-go-lucky Mumbai housewife whose routine life changes when she unexpectedly lands herself with the exciting job of a night RJ (radio jockey) on a leading radio station.